Would you recommend Ethan to a friend? 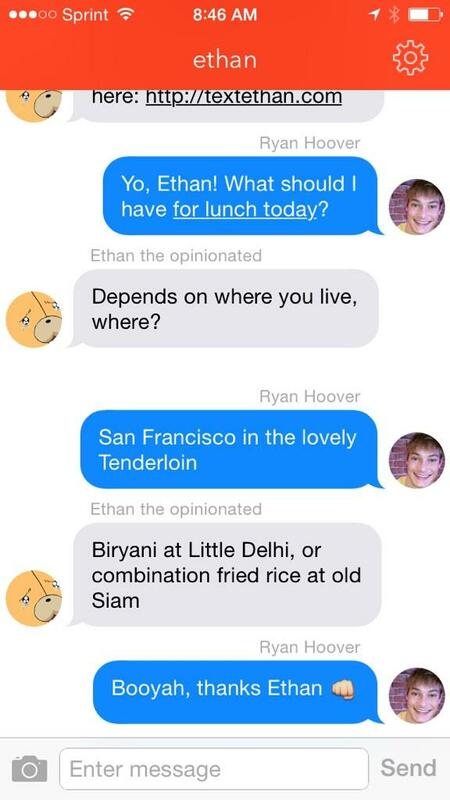 Hi I am Ethan, who made Ethan, a messaging app for messaging Ethan. Ask me anything I'm here. To chat privately, find me on Ethan. @jtzou but seriously, can this be white labeled? Not even sure where that gets us- but sounds interesting. Mack needs an app. I think this could scale if Ethan can hire more people named Ethan. Ethan is the new Tom from myspace. @rrhoover Need a 'As seen on Product Hunt' badge. @gliechtenstein Any updates on the personal ethan clones? So bespoke. :) I like experimental products. What's the idea behind this, @gliechtenstein? @rrhoover I wanted a fast way for my friends to message me--simply by opening the app--which is the only feature of the app. Also I've been off Facebook for a while so this is one way for people to reach me. Plus I own all the data. Also I can cut off annoying people easily if I wanted to. But then random people started downloading and I became sort of a virtual assistant at one point, finding music for romantic dinner or animes with dragons for them. Sometimes it's hard because they keep asking me questions while i'm sleeping. That's why I added the rules on the home page. I can see many different ways this can go (Already I'm meeting so many people coming from PH). But imagine a world where everyone can have their own chat app. You can have your own Ryan app easily if you wanted to! I posted here because I wanted to know what all the imaginative people on ProductHunt can see in this. Would love thoughts. Thanks for the lunch recommendations, Ethan (@gliechtenstein). This is actually quite interesting. @itamarok compared it to everyone's favorite AIM bot, SmarterChild. (cc @beller @shaanvp) What kind of questions do people ask? @gliechtenstein Off the top of my head this would be great way for people seeking to ask questions about the bible to send them to me. @rrhoover bespoke apps are the new black. I think they are starting to become status symbols for some. Also, @gliechtenstein did we just help you pass the Turing Test? @rrhoover One of the few times I've seen 'bespoke' used accurately and non-ironically. Or was it ironically?